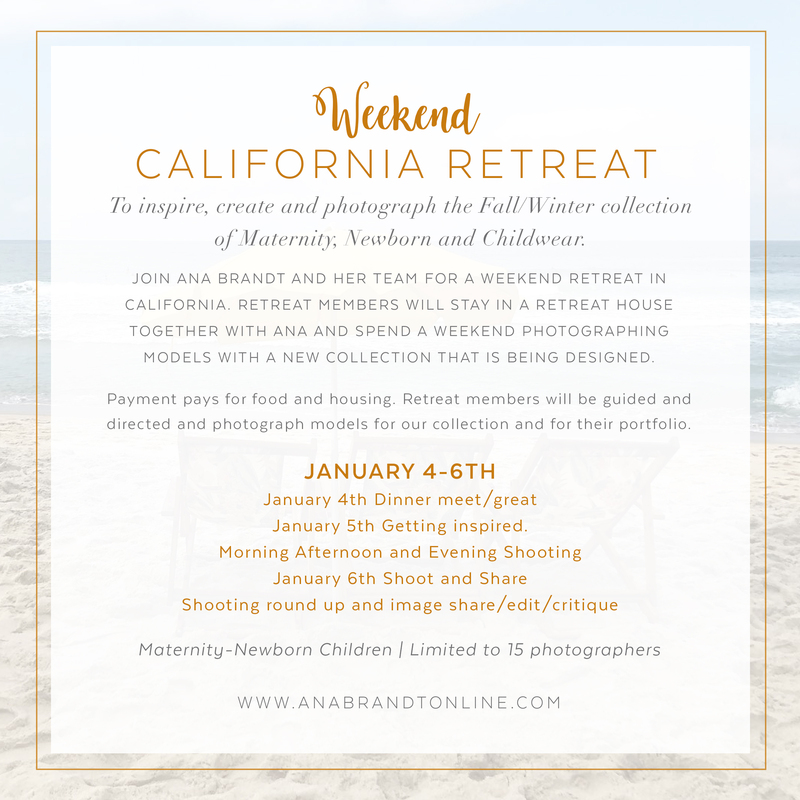 In this new Retreat, Photographers will be learning, shooting and getting inspired. Photographers will be photographing pregnancy and newborn in a retreat-style environment. 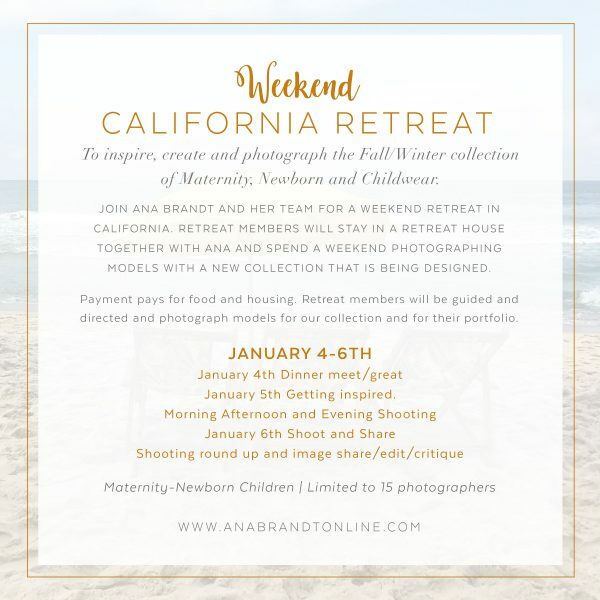 Come hang out with Ana in Southern California. 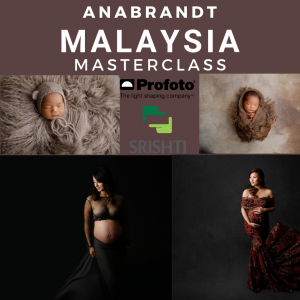 We will photograph new maternity gowns, and of course newborn in the mornings. Come and build your portfolio and learn as you go. All sessions will be styled with hair/makeup/gowns and you will be guided in settings and light. This retreat is for all levels and for those who want to get inspired and push their creativity to a new level. Includes $100 credit for a Maternity gown of your choice. Meet/great/Dinner 5:30-8:30pm – Goal planning, Current Challenges, Setting our expectations. Get your breakfast early newborns come at 8am! We will pose and photograph newborns all morning. Several newborns will come in and we will work in teams. Posing, Wrapping, Lighting is all taught. 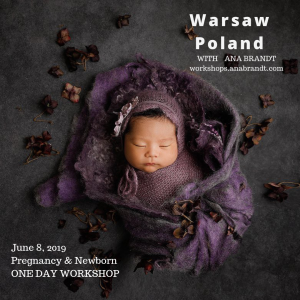 We will work with studio and natural light and work with the idea that we can shoot newborns successfully anywhere. 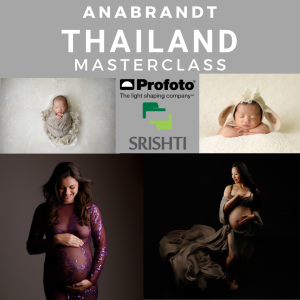 After lunch, we will go over our newborn images and any challenges we had or will have. Editing will be reviewed and discussed. In the afternoon we will photograph pregnancy inside. We will work with gowns, fabrics and all different lighting situations. This retreat is designed to take your work to a higher level! After pregnancy, students have a rest hour before dinner. We meet up for Dinner and shoot on the beach! On our last day we have early morning breafkast and newborns and babies. We will photograph newborns as well as babies 6-12 months. We have lunch and check out and spend time in the afternoon going over your work, your ideas, marketing and where to go from here!